In August 2014 Trade Aid NZ opened their new chocolate factory in Christchurch. Geoff is Trade Aid’s visionary manager. It’s not just any chocolate factory. 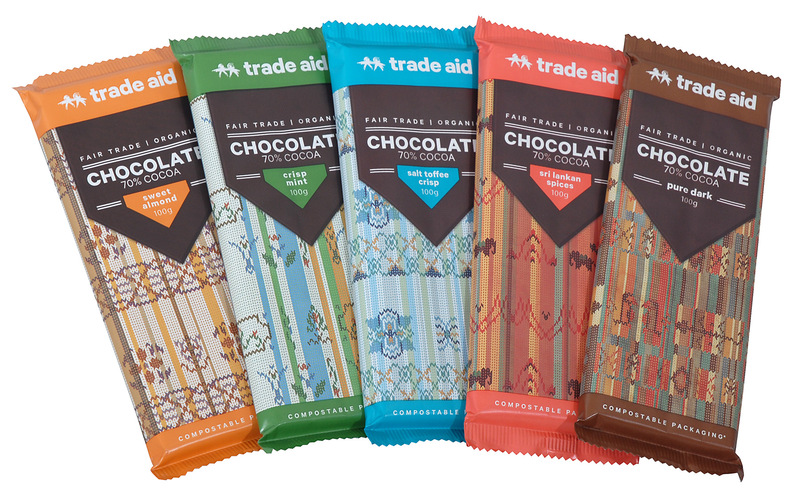 Trade Aid was the world’s first fair trade organization to manufacture 100% organic chocolate. It’s an important distinction. Some commercial chocolate manufacturers do make one or two products that carry fair trade certification, but that’s no guarantee that their business is run on ethical principles. Trade Aid is different. It’s a not-for-profit organization and the whole reason for its existence is to promote fair trade and to work ethically in partnership with producers around the world, in a relationship of mutual respect. Organic chocolate that’s fair trade throughout the supply chain. The farmers who produced the raw ingredients have been treated fairly. The ingredients for the chocolate are organic, so the farmers haven’t had to risk their health handling toxic pesticides. Organic production also enriches precious soils. You benefit too by choosing organic foods; you’ll avoid the cocktail of chemicals that ride along with many commercially-produced foods. The factory is owned and managed by a not-for-profit fair trade organization so you can be confident that the entire supply chain is run on ethical principles. 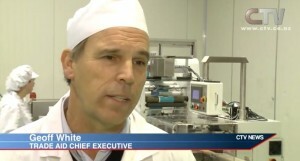 It’s worth watching the video of Geoff taking a TV news crew through the new factory. Geoff and the chocolate factory. This entry was posted in Activism, Fair trade, Food and tagged activism, chocolate, fair trade, food, organic, World Fair Trade Organisation by Brian Loffler. Bookmark the permalink. And it’s flipping delicious, too!